I don’t like swim suits and have constantly looked for a better solution. The hatred of bikinis began in junior high. That’s when I jumped off the high dive and had a “wardrobe malfunction” – right in front of the boys! The earth did not swallow me up, as much as I wished for it. I moved on to a tankini, thinking it would solve my wardrobe problems. That delusion ended when I lost the bikini bottoms while launching a sailboat in heavy surf. Then there was the problem of containing “the girls”. Most swimsuits are not designed for curvy women. Modest suits cost hundreds of dollars. My loathing of standard swimsuits grew. Surely there was something that allowed full participation in water sports at a reasonable price. Thankfully, a solution exists! Sun-savvy designers are creating innovative options in rash guards as swimwear. What’s even better? The new swim pieces make perfect multi-use travel garments. Swim tops from Lands End. Capri from HydroChic. Swim dress from Athleta. Skirt from LL Bean. Back in the old days, designers viewed sun protection as a functional necessity with no thought toward style. Rash guards looked like workout shirts and many of them had huge logos printed across the chest. Those days have changed. Many swim companies are designing cute shirts and bottoms that offer UPF 50+ protection. Rash guards shirts come in a variety of styles and sleeve lengths. Manufacturers offer swim bottoms as shorts, skirts, skorts, capris, or tights. You can even find swim dresses! Many of these pieces look like normal street wear. That means you can use them as part of your capsule wardrobe. They also have properties that make them great for travel. They offer UPF 50+ sun protection – How do you stay out in the sun all day without risking burn or skin cancer? Rash guards with UPF 50 protection block out 98% of the sun’s UV rays. They dry quickly – Rash guards are swimwear, so the material is designed to dry quickly. They wick moisture – The properties that let the rash guards dry quickly also mean that they wick sweat away from the body. This makes them a great choice for other outdoor activities, such as hiking and running. They shed dirt – The synthetic material resists dirt and stains. Many spots disappear with a light wipe from a damp cloth. They come as separates – Each piece is sold separately, allowing you to mix and match as needed. Layer rash guards over sports bras and bike shorts if you want greater support. Bonus – drying time is reduced because each piece dries separately. Swimsuits usually have multiple layers of material which slows drying time. They look like normal clothing – Many rash guard tops look like knit tops. Some swim skirts and shorts come in conservative lengths that you could wear beyond the beach. Some bottoms even have pockets! Solid black swim capris and leggings are indistinguishable from the non-swimwear versions. Swim sets from Lands End, Lime Ricki, Swim Outlet, Athleta. They are tight fitting – Rash guards are worn close to the body to prevent air pockets (bubble bust anyone?). Some people may not want a close fit. They don’t come with undergarments – Rash guards don’t normally come with a built in bra or undies. You’ll need to wear another garment underneath them, either a swim suit or a sports bra and bike shorts. They are synthetic – Most rash guards are made out of nylon, polyester, and lycra. That means that they hold odors. You’ll need to shampoo them regularly if you want to eliminate stink. They require special care – New materials reduce the chance of abrasion and pilling, but don’t eliminate it. These garments will also melt if you throw them into an industrial dryer. They need hand washing and air drying. They look like polyester – Some of the patterned rash guards are only printed on one side. That gives them the appearance of cheap discount clothing. So how do rash guards work as travel clothing? Quite well, actually. The material is very light weight and resists wrinkles. The tops are surprisingly cool for hiking. The tighter fit of the top restricts air movement, making it warmer than a loose garment. The garment wicks sweat quickly though, and I’m fine hiking in 80 F (27 C) sun. The quick dry properties make them great garments for outdoor activities, such as jungle treks or mountain hikes. The leggings are great for all day activities in the sun, such as snorkeling or inner tubing. They make a nice layer under pants, just like regular leggings. I usually wear a sports bra or bike shorts under my rash guards. The support is superior to bathing suits. My black rash guard top combined with the black fitness skirt looks like a casual little black dress. I wouldn’t wear it to the opera, but it’s fine for a casual restaurant. The perverse part of me smirks at wearing my “bathing suit” off the beach. I have a single outfit that works in multiple situations. The best part, of course, is that I can fully participate in swimming, snorkeling, surfing, sailing, whatever without the worry of sunburn or loss of clothing. And now I can do it while looking cute. Tops from Lands End. Skirt from LL Bean. Capris from HydroChic. Board Shorts from SwimOutlet. Rash guards and swim clothing have evolved over the past few years. Many tops and bottoms look like normal clothing. If you are going on a water trip or adventure travel trip you should consider bringing along rash guards instead of a swim suit. They will expand your capsule wardrobe while protecting you from the sun. This is an example of why I love your blog–another great idea! I take cycling vacations and travel very light. 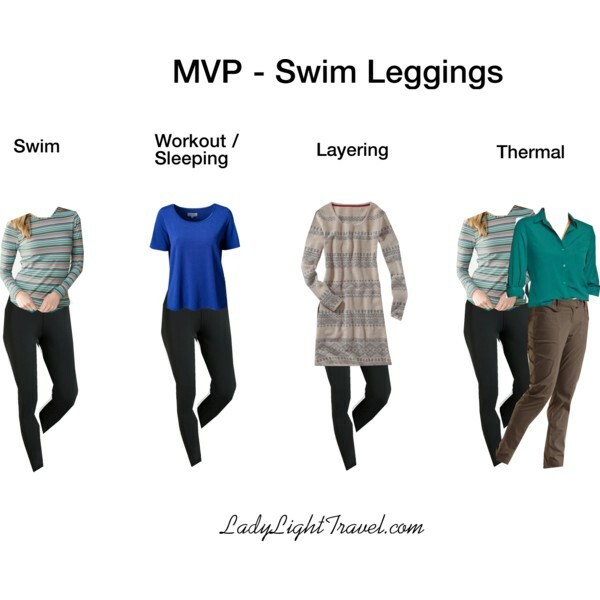 I want my clothes to do triple duty, like these options that work for cycling, street wear and swimming/paddling. Thank you! You might want to check out the LL Bean fitness skirt featured in the article. It rolls up small and may be pulled over bike shorts. Keep it in your bike bag and pull it on when you stop. The skirt is 20″ long so hits at knee length – just right for Europe etc. i think the same :) nice ideas! I don’t mind baring my midriff as I enjoy a sport that has, as a fun side effect, given me a nice core. I do something similar when I travel. I travel with a black, thick-strapped racer-back sports bra from Target that is a cup size (actually possibly two cup sizes; other large busted ladies know what I’m talking about) too small and some Ex Officio briefs, also in black. Plus, from Target, I have a workout skirt which has built in shorts that is *also* in black. 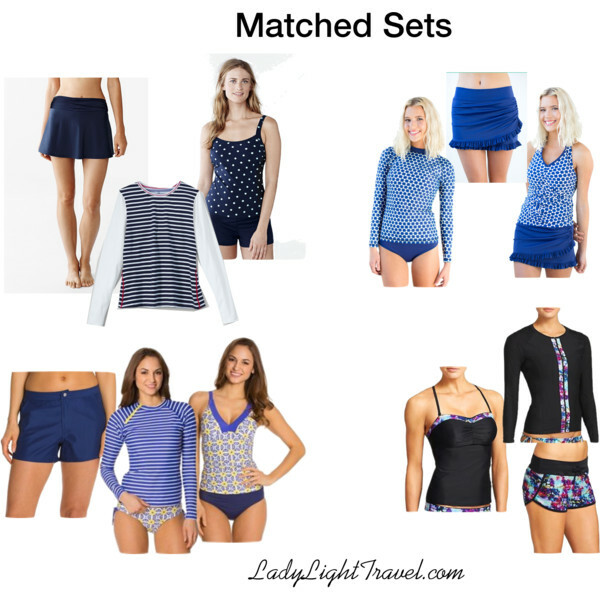 With these pieces, I can have underwear and work out for my sport – which is usually at least part of the reason I am traveling – plus I can pair the sports bra with either the briefs for a bikini look or with the workout skirt/shorts for a more flirty swim suit look and go swimming in them. This is a nice solution for those in great shape and who aren’t participating in wave-oriented water activities. I stick to rash guards because I don’t have to wear (much) sun screen and can stay in the water longer. I’m also starting to pay the price for too much sun in my youth!